The Tibetan language is almost as mythical as the culture of the six million people worldwide who speak it. It is the language of the Dalai Lama and the language of dharma, the buddhist teaching. Its elaborate writing system and tongue-tying pronunciation make Tibetan – or ‘pö ke’, in its native form – something of a beautiful mystery. Here are 10 fascinating facts about this ancient tongue. The Tibetan alphabet consists of 30 letters that are arranged in a logical order. The rows are arranged according to the articulation of the sound (how the sound is formed) and column according to the acoustics of the sounds (level of involvement of the voice). The script used originated from India and so did many words of the Tibetan vocabulary, since many of the first Tibetan texts were translations of Buddhist scriptures from Sanskrit. 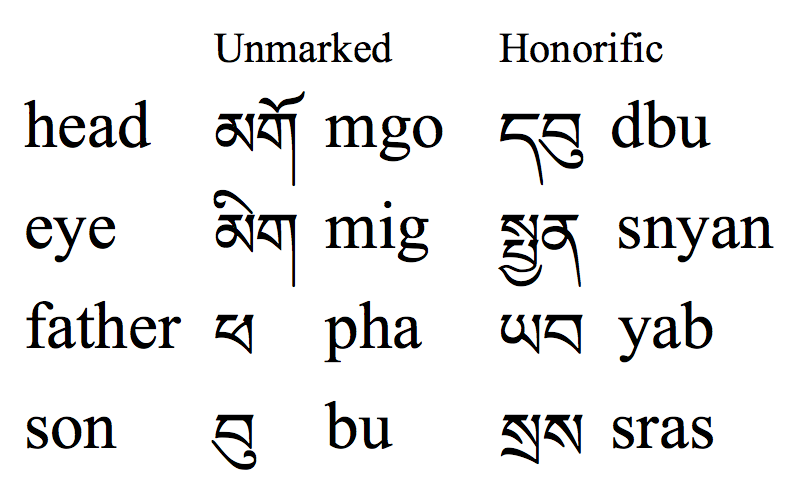 Nouns and verbs in Tibetan have polite forms, or so-called ‘honorifics’. This means that depending on who is addressed or referred to in a sentence, words may modify to show respect. Often the different words do share similarities, but at times they are completely unrelated. The usage of these words is up to the discretion of the speaker/writer, but as a rule religious leaders and elders are addressed in a respectful form. The letters of the Tibetan alphabet are not just connected to each other one by one. One of the letters is taken for the root and then the other letters are added not only before or after the root, but also on top of and under the root. Here’s the catch – depending on its position in the word, the letter transforms to better the fit shape of the word. 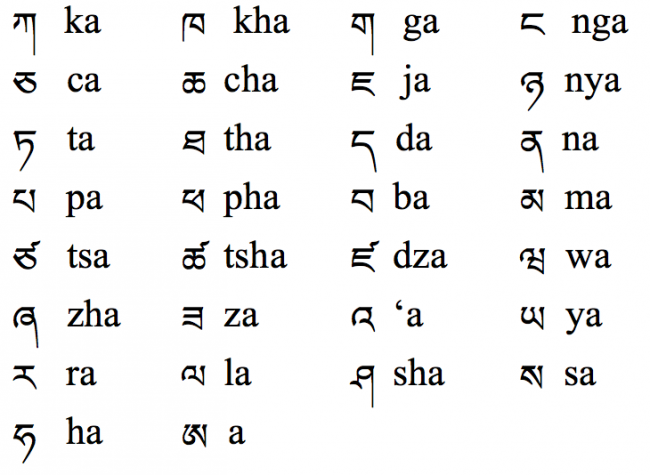 In the Tibetan language, every letter is followed by the ‘a’ vowel sound sound by default. To change the vowel sound, a diacritic sign (a sign to indicate difference in pronunciation) is used. The e, o, i sounds are marked about the root letter of the word and the u sound is marked below. Although a word can be made up of a maximum of seven letters, at times these letters are not pronounced. Therefore a number of words may be pronounced exactly the same and are only differentiated in writing. The reasons for the different spelling of similar sounding words is to differentiate them in writing. Also, some of the letters may not necessarily be pronounced, but may modify the vowel or the pronunciation of consonant clusters in the word. The Tibetan language does not use standard punctuation. There are a number of used symbols, many of which are decorative. Below are examples of the most typical punctuation signs that are used in both secular and religious texts. 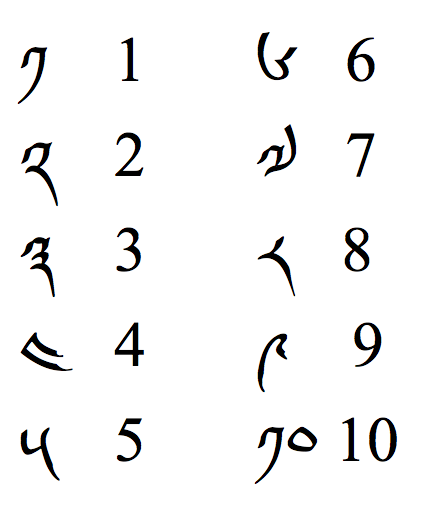 Although now Tibetan has become more accepting of the Arabic number system, the Tibetan language has its own system of writing down numbers. Speaking of numbers, if you ask a Tibetan to do finger-counting, they won’t bend down one finger at a time, rather they will use their thumb to count the phalanges of the finger (the three bones that make up every digit). 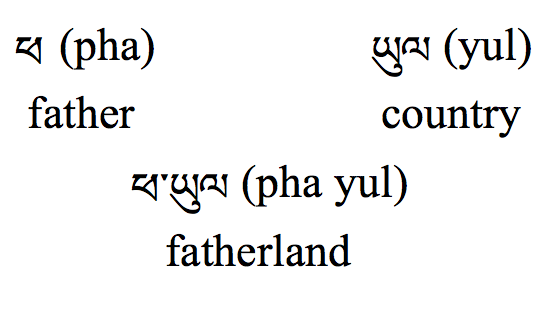 The Tibetan language is made up of syllables. These syllables are separated from each other by an apostrophe-like dot, called the ‘tsheg’. Other than that, the borders of words are left unmarked, and defining where a word starts and ends is left to the discretion of the reader. The oldest written record of the language has been preserved on a stela located in the capital city of Tibet – Lhasa. Content-wise, the stela is an appointment notice of a minister alongside a description of his good deeds and service to the country. The monument is known as the Lhasa Zhol Pillar and dates back to 764 CE. Following the craze for the Tibet in the 1980s, the Tibetan language and culture permeated the West – something that didn’t pass by the film industry. Ewoks, the furry teddy bear-like creatures in the Star Wars films, speak a language that is by most part the Tibetan language run backwards. It may well all sound like messy nonsense, but sometimes phrases are spoken that make perfect sense in Tibetan, as confirmed by native speakers. Ewoks in a forest | © Lucasfilm Ltd.